Are Snap-on-Smiles easy to care for and look after? You can wear your Snap-on-Smiles while eating. However you must remove the appliance for cleaning your teeth and to clean the appliance itself. If your teeth are not cleaned twice a day with toothpaste, dental floss and mouthwash then the risk of tooth decay can increase. Pieces of food can easily become lodged between your Snap-on-Smiles and your natural teeth and gums. Snap-on-Smiles are designed especially for your jaw and your teeth. This means that it should fit securely in place with no loose parts or movement. You should return to your dentist to have it checked if you find that your appliance is not secure enough. There should be no long-term irritation on the inside of your mouth as the appliances are designed to be as comfortable as possible. If you do find there is irritation in the inside of your mouth then it may be that adjustment is needed to the shape or size of your appliance. As your Snap-on-Smiles appliance fits right to the gum line other people should not be able to notice your wearing it and any imperfections, gaps or discolouration on your own teeth should be covered. Your speech will naturally be affected when you receive your Snap-on-Smiles but this should only last for a few hours. The length of time that the speech is affected will be different for each patient. Your dentist should be able to offer advice and verbal exercises to help speed up the acclimatisation process. This is entirely down to you as an individual and what your preference is. If you choose a shade that is not too “Hollywood” then the results should look completely natural. A lot of dentists recommend that you choose a shade similar to the whites of your eyes. This prevents other people being drawn to your teeth by the startling white colour. However, if that is the result you’re hoping for then so be it! Snap-on-Smiles can be fabricated with varying degrees of thickness to offer a more natural contour according to your own teeth. What are the disadvantages of using Snap-on-Smiles? While Snap-on-Smiles are a great short-term temporary fix for any problems with your smile, it should be noted that each appliance does have a short lifespan when compared to other more permanent treatments. Depending on how well you take care of them, and how often you wear them, they should last between 3 to 5 years. Obviously, wearing them when eating particularly hard foods will wear them down much faster. You will be able to enjoy the benefits of Snap-on-Smiles for longer if you take good care of your appliance and your own teeth. This will mean it will be longer before you need to go back to the dentist for another set, or opt for a more permanent long-term remedy. 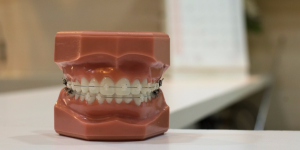 It is important to note that you cannot wear Snap-on-Smiles while you are undergoing other cosmetic dentistry procedures such as braces or aligners. You can, however, wear them while you are having treatments like teeth whitening.